Known as Joey to his mother and sister, Joseph to his aunt, and “Ba” to his younger brother, the main character of this tale by Joseph P. Myers loves bugs. His daily quest is to find ants, caterpillars, pill bugs, dragonflies, butterflies, crickets…any type of creature of the earth. All who know Joey are aware and considerate of his fascination. Until Joey decided to explore the complexities of the bumble bee. His mother warned him. His father warned him. But Joey turned a deaf ear on their concerns. Upon finding a bumble bee crawling inside a particularly colorful flower, Joey takes the opportunity to fold that bee up in the petal to research the bee’s reaction. Joey holds the bumble bee captive for quite some time before tiring of the game and releasing his hold on a now very, very angry bee. Joseph and the Bumble Bee by Joseph P. Myers is a delightful story of youthful curiosity. 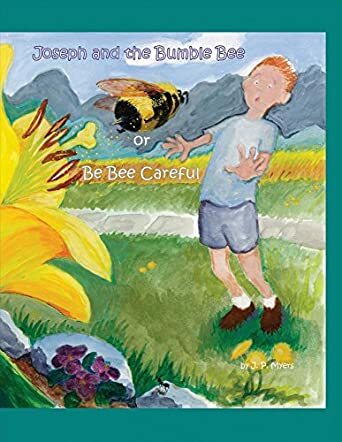 Set in an ethnic-diverse 1950s town, Joseph and the Bumble Bee incorporates Pennsylvania Dutch influences, making this both a fun story to read but also a lesson in cultural diversity. As a former public school teacher, I can imagine this being a lesson plan within itself. I like that the illustrations go from colorful to black and white sketches when the bee is angry about its imprisonment. This is a great example of a lesson on elemental writing. This is a perfect addition to any school classroom, library, or private collection.